Back at the Big Summer Potluck, there was one dish that caught everyone’s attention. That’s not a small feat among a group of food bloggers. But one morsel was the belle of the ball. And they may very well be my undoing. Because nothing tastes as good as mini muffins that have the texture of a doughnut and a buttery, spiced sugary coating. I purposely redid the recipe to make them bite sized because I know firsthand that making them full size is no guarantee that I won’t just keep eating them. I’ve joked with Jen of How To: Simplify, to whom we all pledged our allegiance for bringing these into our lives, that the secret ingredient in the recipe is crack because these morsels are utterly and completely addictive. And as if the original isn’t enough, now I see that Tracy of Sugarcrafter, another Potluck alum, went and made a Caramel Apple version for fall. I sent them both a passive/aggressive tweet saying that I will hold them personally responsible when I can no longer fit into my jeans. But there’s a little part of me that says that if I have to go up a pants size, these muffins are a pretty damn good reason. And please, hold your judgment until you have experienced the ecstasy that is the mini doughnut muffin. Heat oven to 350 degrees and spray two mini muffin tins with nonstick cooking spray. Combine the flour, baking powder, salt, and 1/2 teaspoon cinnamon in a medium bowl. Combine the oil, sugar, egg, and milk in a large bowl. Add the flour mixture to the wet ingredients and mix just until combined. Fill each muffin cup approximately 3/4 full of batter and bake for about 10 to 12 minutes or until a toothpick inserted in the center comes out clean. While the muffins are baking, combine the 2/3 cup sugar and 2 tablespoons cinnamon in a small bowl and make sure your butter is melted. When you remove the muffins from the oven, immediately remove them from the pan, dip them in the melted butter, and then coat them in the spiced sugar. Squeeeee! 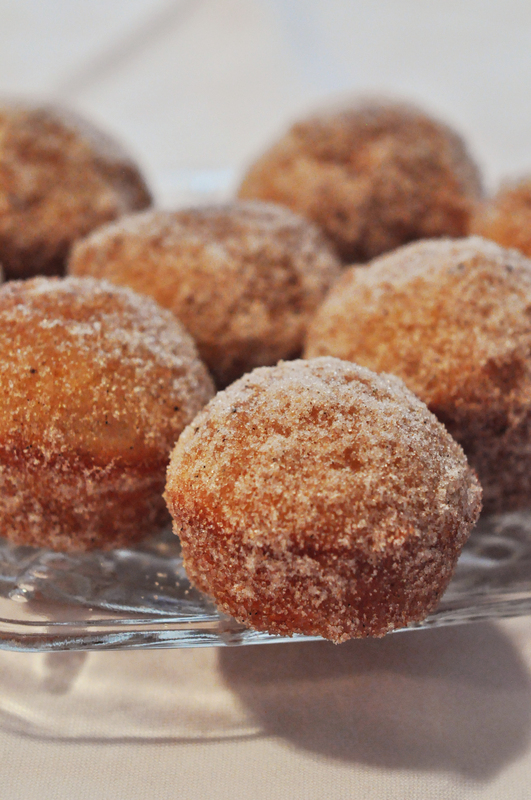 Mini donut muffins!! Soooo cute. So edible. So crack-like. I have a mini-muffin pan in the shape of hearts. How perfect would that be to pledge our undying love to these little gems? Jennifer, making them in the mini muffin pan was the smartest thing I could have done. Did you see that Tracy @ Sugarcrafter posted an apple caramel variation? I might have to explore those this weekend during the Pity Party. I made Tracy’s Caramel Apple Muffins and let me tell you…they were AMAZING. Be sure to make them this weekend. You are going to love them! So should I send my Visa bill for the bigger big girl pants to you or Tracy? Because now I don’t think I can live without trying the Caramel Apple version of these. seriously, i’m tucking this recipe away for use when i have an AM meeting to cater at work. Lan, there is never a wrong time for these morsels. Why wait until there’s a work meeting? Make a batch of these muffins this weekend. On the off chance there are any left on Monday, you could take them into work. Or you could keep them all to yourself. I love sugar-covered doughnuts, but I hate the frying process. (I used to have to dunk things in the fryer at the Sizzler and I always smelled like grease afterwards – that left a scar.) So it’s great that these are baked in an oven – much easier! Jen, these morsels will give you a doughnuty texture without the frying. I have a recipe for donut muffins bookmarked somewhere. Now I have to try them! Kathy, if your recipe produces results anything like these little treats you have been missing out. Go forth and bake. Thank you for miniaturizing them. While I’ll most likely end up consuming twice as much doughnut love than if they were regular size, the fact that they’re mini will be just enough reassurance when I join you in the next-pants-size-up crew. Ali, I try and convince myself that because they are mini that I haven’t eaten quite as much. I have yet to actually believe that. But I keep eating them anyway. That’s what crack does to you. Say it with me…crack is whack…thank you Whitney Houston for the sound bite of my life. Jen of How To: Simplify, my original doughnut muffins dealer , is from DC/NOVA. The three of us should definitely get together. Oh, you little morsel of cinnamon and sugar, how I long to put you in my mouth. Until we meet, I’ll keep you starred in my google reader so that I’ll easily find you again. Although I’m certain that I could never forget how we parted, though we’ve never met, know that I’ll keep the thought of you close to my heart. Brooke, I don’t think any of my posts have ever received a love letter before. You chose a worthy recipe to pledge your love and longing to. I loooove these. I made the ones off of PW’s website! Beth, I think that was the ultimate origin of these as well. Durn that Ree and her Tasty Kitchen. My kids would love these! A must-try! Kitch, why in the world would you share these with the little people? They are to be hoarded and devoured. But maybe you’re a nicer mom that I would be. Then again, from what you said over on Twitter, you subject your young daughters to the musical stylings of Survivor a la Rock Band. So, maybe not. I though the mini size was a solid strategy against eating too many muffins. I. WAS. WRONG. Thanks for the mention! I feel honored to be listed among such cracktastic treats. 😉 I agree that both of these muffins are insanely addictive – I will have to try making mini versions as well in a valiant attempt at portion control! Tracy, say what you like but there is noway to silence the call of the doughnut muffin. Size is irrelevant. It would be a sin not to make these. Oh, I just got a chill. Deliciousness. Tracy, it absolutely would be a sin not to make these. I plan to try the caramel apple version this weekend just in case you find yourself on my side of town and in need of a treat. You know when you hear about a movie & maybe have a ‘not sure’ moment about one of the actors in it? And then you hear nothing but rave reviews & how its a ‘best ever’ & ‘must go see’! Know what I mean? Ingrid, just remember not to overfill the muffin cups otherwise batter and topping will end up all over your oven.